After the Nixon and Ford administrations, liberal Democrats hoped Jimmy Carter's election in 1976 would restore the New Deal agenda in the White House. Instead, during four tumultuous years in office, Carter endorsed many of the fiscal and economic policies later espoused by his Republican successor, Ronald Reagan. But Carter also backed most New Deal social programs and, however reluctantly, pursued a traditional containment foreign policy. In this book more than a dozen eminent scholars provide a balanced overview of key elements of Carter's presidency, examining the significance of his administration within the context of evolving American policy choices after World War II. They seek not only to understand the troubled Carter presidency but also to identify the changes that precipitated and accompanied the demise of the New Deal order. By the time Carter took office many Americans had become disenchanted with big government and welfare spending, and his presidency is viewed in these pages as a transitional administration. As this volume demonstrates, Carter's dilemma emerged from his effort to steer a course between traditional expectations of federal government and new political and economic realities. While most of the contributors agree that his administration may be justly criticized for failing to find that course, they generally conclude that Carter was more successful than his critics acknowledge. These thirteen original essays cover such topics as the economy, trade and industrial policies, welfare reform, energy, environment, civil rights, feminism, and foreign policy. 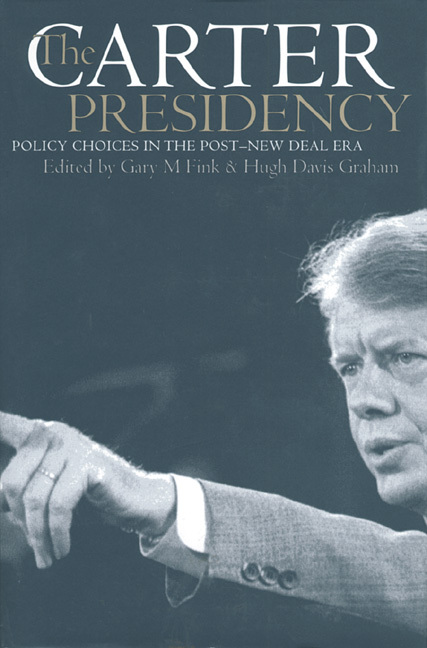 They offer thoughtful assessments of Carter's performance, focusing on policy both as cause and effect of the post-industrial transformation of American society that shadowed his administration. A final essay shows how Carter's public spirited post-presidential career has made him one of America's greatest ex-presidents. Grounded on research conducted at the Carter Library, The Carter Presidency is an incisive reassessment of an isolated Democratic administration from the vantage point of twenty years. It is a milestone in the historical appraisal of that administration, inviting us to take a new look at Jimmy Carter and see what his presidency represented for a dramatically changing America. Gary M. Fink is professor of history at Georgia State University and author of Prelude to the Presidency: The Political Character and Legislative Style of Governor Jimmy Carter. Hugh Davis Graham is Holland N. McTyeire Professor of American History and professor of political science at Vanderbilt University and author of Civil Rights and the Presidency.